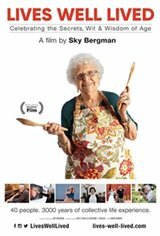 Lives Well Lived celebrates the incredible wit, wisdom and experiences of seniors aged 75 to 100 years old. Through their intimate memories and inspiring personal histories encompassing over 3000 years of experience, forty people share their secrets and insights to living a meaningful life. These men and women open the vault on their journey into old age through family histories, personal triumph and tragedies, loves and losses - seeing the best and worst of humanity along the way. Their thoughtful perspectives reveal a treasure of life lessons and a reminder of the greatest role models in our own families.